About Retirement Education Services Ltd.
Retirement Education Services Ltd is one of the longest established training consultancies in the field of planning for retirement. It runs around 100 courses/seminars a year for large and small employers alike. Retirement Education Services Ltd was created initially as a separate Division of Tony Wheeler Associates in order to focus exclusively on life planning and retirement planning & training issues. Tony Wheeler Associates commenced trading in 1986 offering a comprehensive range of training services to commerce and industry. RES became a separate Limited Company in 2003. Tony launches the Talking Retirement CD package with Ed Vaizey MP. The Managing Director of RES is Tony Wheeler. Tony has been involved in retirement planning & training since 1976. In 1985 he won a scholarship to research retirement planning, comparing the United Kingdom with Germany and Sweden. In 1993 he produced an innovative and unique audio-tape self teaching retirement training programme. It was launched to employers by Robert Jackson, MP at the House of Commons. During 1996-97 the European Union grant aided Tony to make an audio-tape training programme in German to increase the training methods available concerning planning retirement. This package is called ‘Fit fur den Ruhestand’. 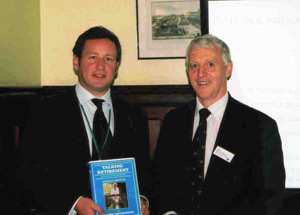 In April 2006, a new 4 audio CD version of Talking Retirement presented by Angela Rippon was launched again at the House of Commons by MP Ed Vaizey. Recognised as innovators, in July 2009 RES launched an online version of Talking Retirement designed to substantially reduce the costs of providing retirement planning courses for employers and individuals. There is no advertising or product selling by implication with their package. It is purely unbiased retirement training information.